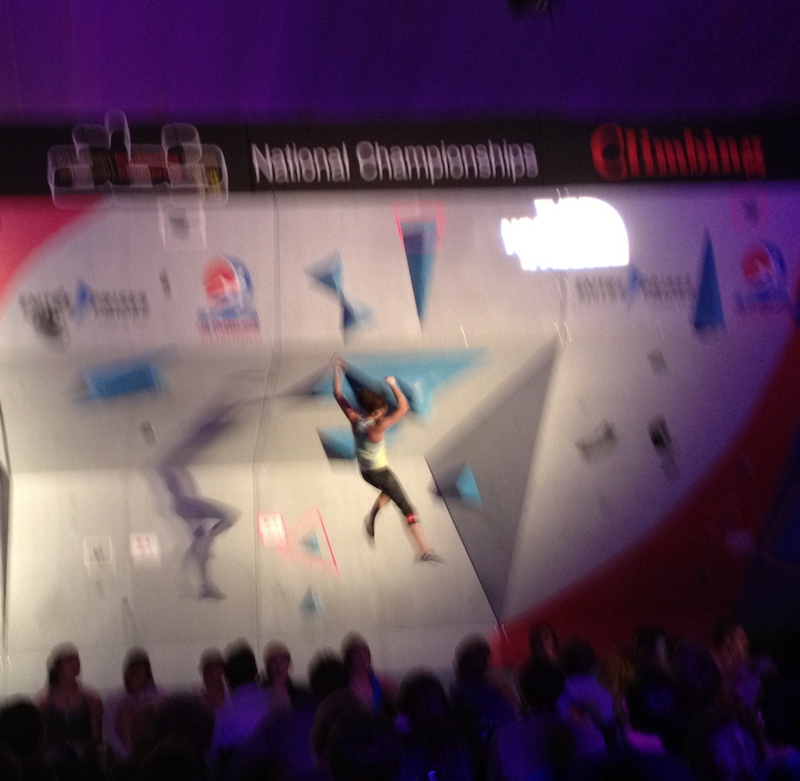 Faus on the 2nd crux of WF1. Her left hand is on hold 5, 8 points I guess? 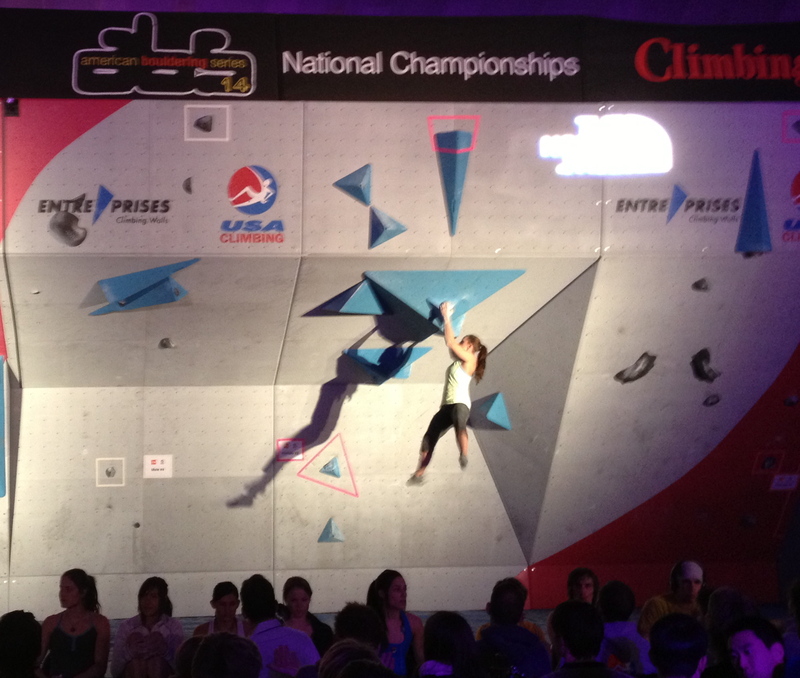 From here she stood up to the next hold, bumped up or matched it, rt foot where rt hand is, balance out right to bad finish jib, switch feet, foot jib out right, match finish jib. Andrea used the same sequence but pressed this move off a heel and was moving super slowly the whole time. It was a pretty awesome display of raw determination. 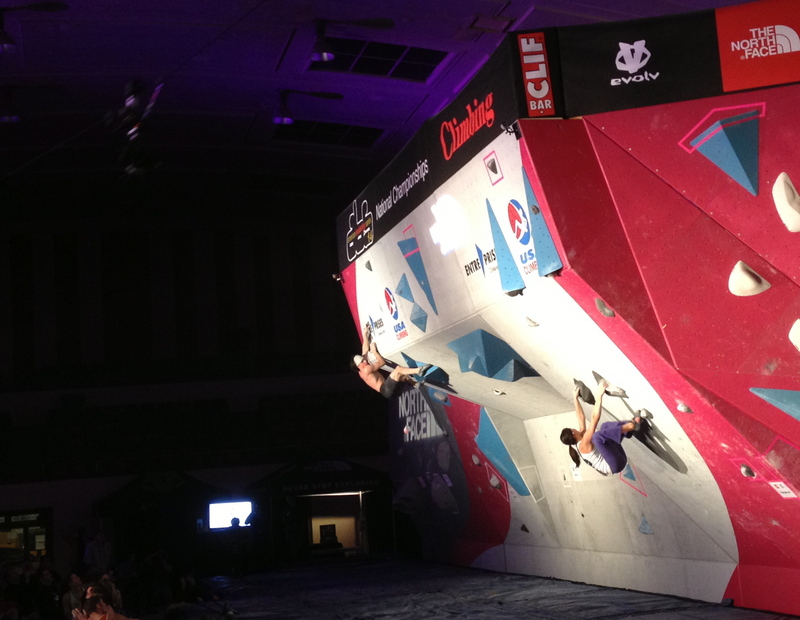 Women’s finals started out in an interesting manner when several of the favorites failed to complete the technical and balancey Final 1. Honestly the problem looked a bit easier if you were shorter, but different methods were discovered by different competitors and it’s hard to say what the problem actually felt like. 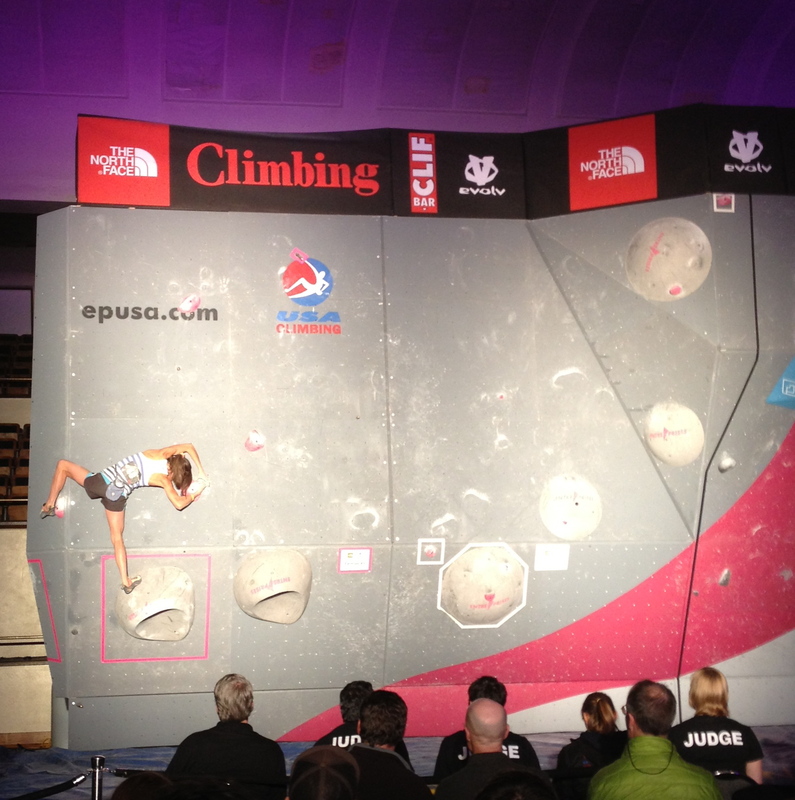 I’d say Isabelle Faus climbed it the easiest, Andrea Szekely climbed it the slowest, and Angie Payne made the most unlikely finish match. 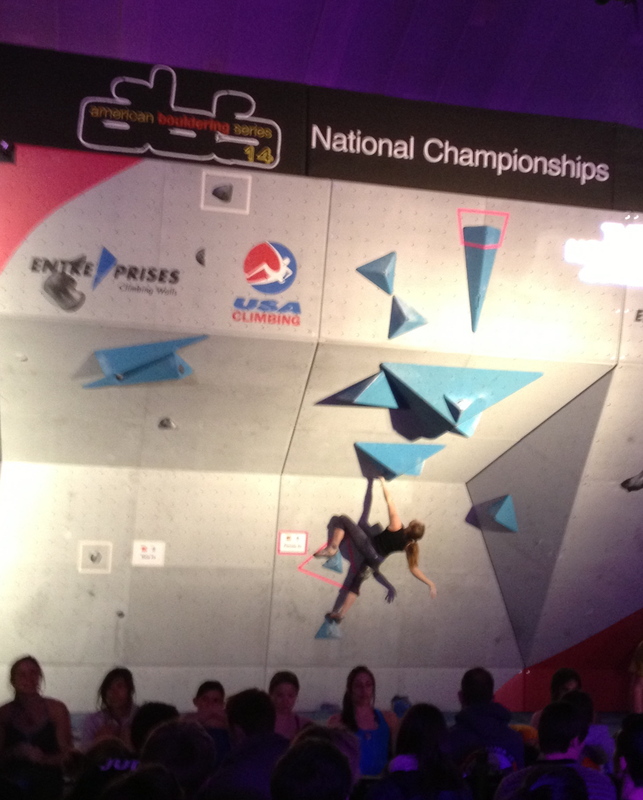 Megan Mascarenas looked to be cruising until she got to the 5th hold or so (which from the results I guess was worth 8 points? ), at which point she stopped and stood for a short while trying to figure out how to go up. Finally she made a wild jump, fell, and then fell on the bottom a bunch. 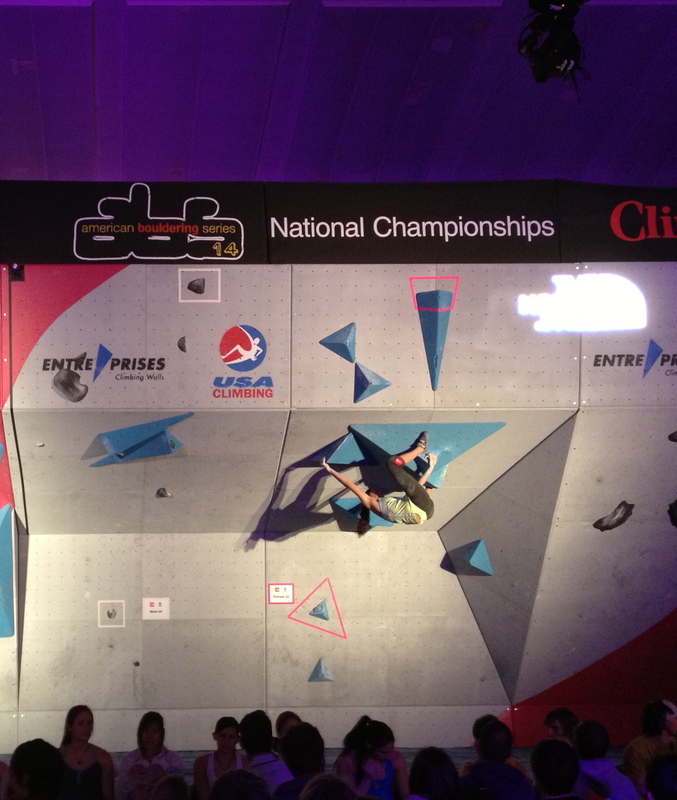 AJ and Lisa Chulich tried a few things to get through the bottom but none of them worked and both got 4 pts for the problem. Several competitors tried this method. Andrea looked the closest to making it somehow work, but it definitely would have been pretty crazy to pull it off. Angie managed the finish match in this extremely balancy way after falling from the move the go before. 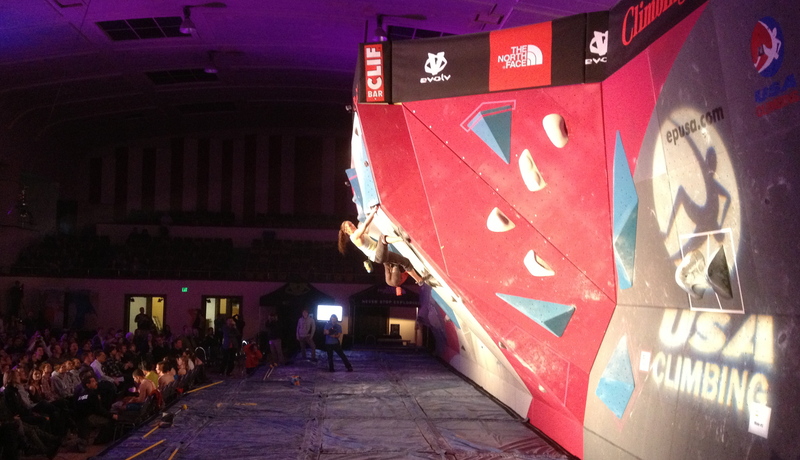 Women’s 2 was a pretty steep, powerful, strange-beta looking rig out the steepest roof on a bunch of volumes. Faus got out a ways before getting stuck going for the hold on the big volume under the lip. AJ came on with some real power and experience and fell jumping out left to a big volume under the lip. …after her major crowd-pleaser moves of spinning around backwards, leg over head, she powered up onto the headwall, sticking and matching the next volume, then fell grabbing the last volume before the finish. AJ pulling a delicate looking hand/heel hold exchange. AJ sticking the first slopey volume over the lip. AJ matched the volume, flipped her low hand, then fell moving up left to the next volume with a jib on it. So close! AJ off. It was an awesome display, but unfortunately she didn’t finish the problem. 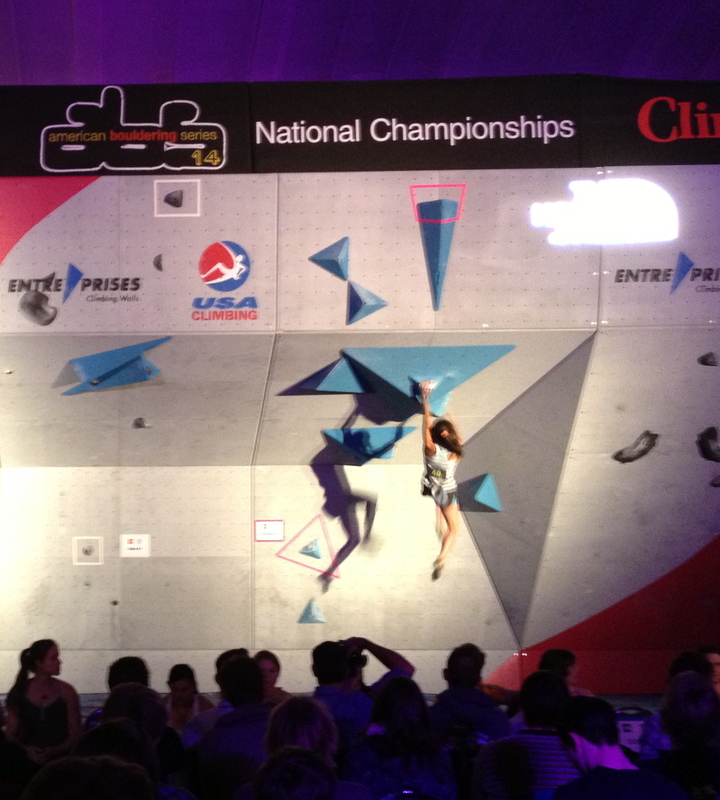 Lisa Chulich is a very powerful climber. She tried the heel from this side but it didn’t quite work out. Sorry it’s so blurry. 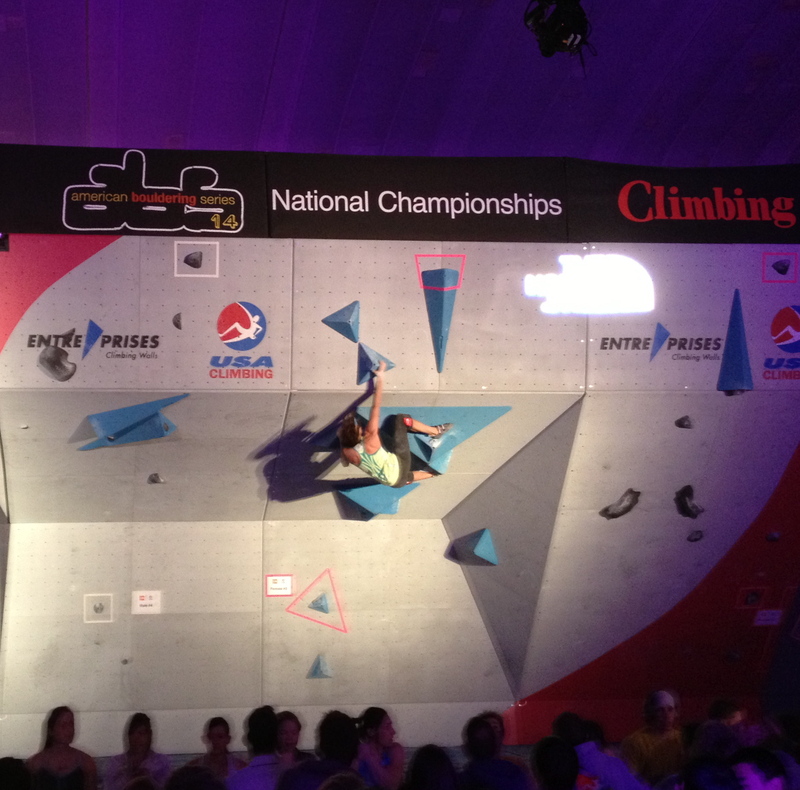 Andrea actually staticed to the slopey bottom of this hold, stuck it, bumped to the good part, then fell. Her body tension is insane right now. Again, sadly I missed most of this one and the pictures I did get are worse than the ones above, if you can believe that. 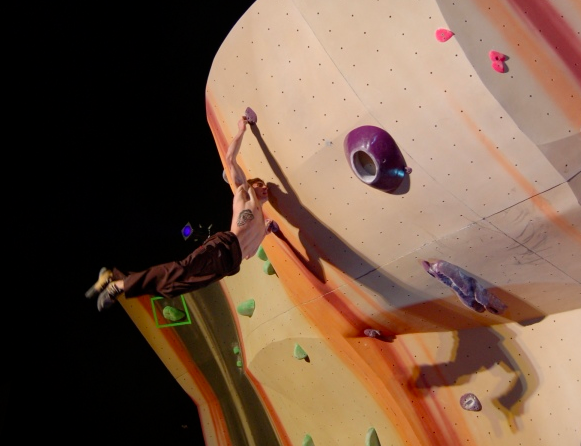 The problem was another technical boulder and was worth 13 points. Faus, Megan, and AJ flashed it. Andrea did it 2nd try and Puccio did it 3rd try. Lisa got hold 7 on her first try, Angie got hold 8 on her 3rd try. AJ on her tremendous flash burn. 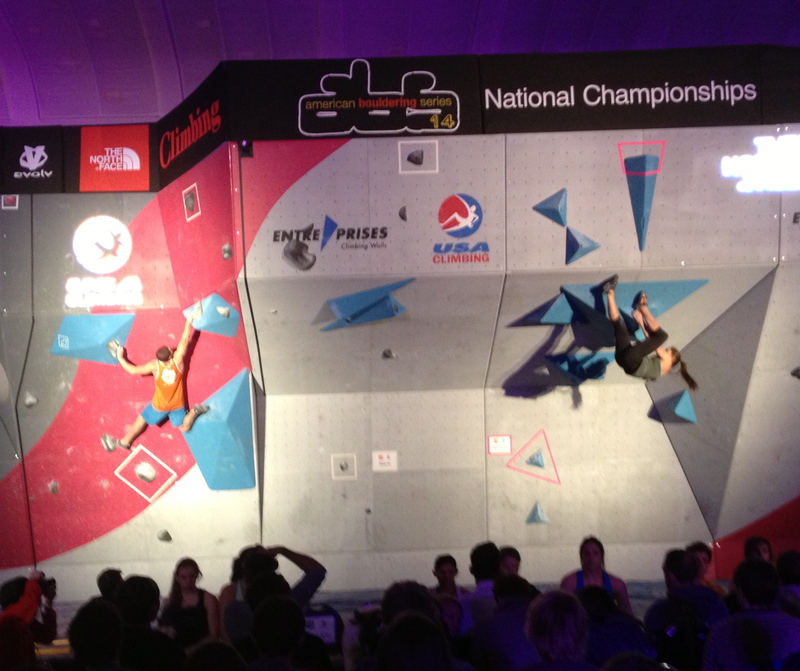 I’m glad I made it back in for this, as to me it looked like the most exciting problem of the night. Power moves out an overhang on some Myorcan tufa slopers and then some volumes on the headwall. Again AJ came out and nearly flashed, fading 2 moves from the top and then not being able to finish it. Basically from where AJ is (hold 9) it was a cross to another sloper on the left side of the volume, then a thrutch to the top. 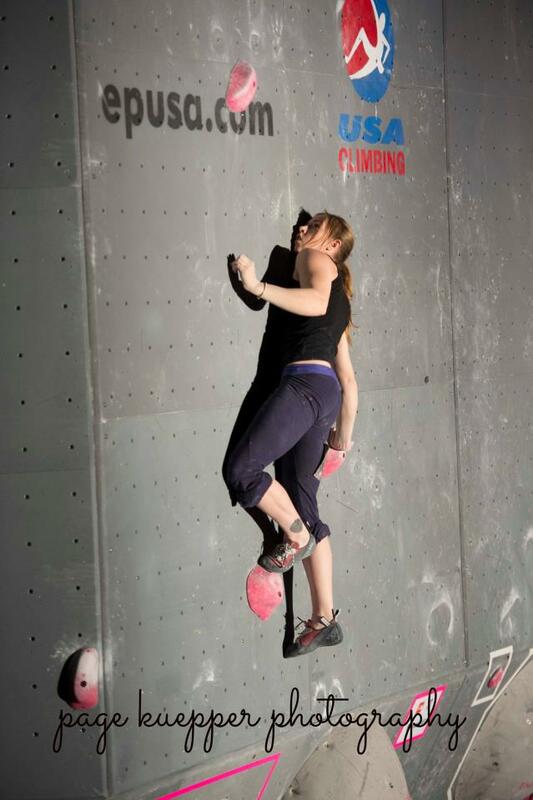 Angie Payne on the first volume hold. Next it’s out right to where AJ is in the picture above. 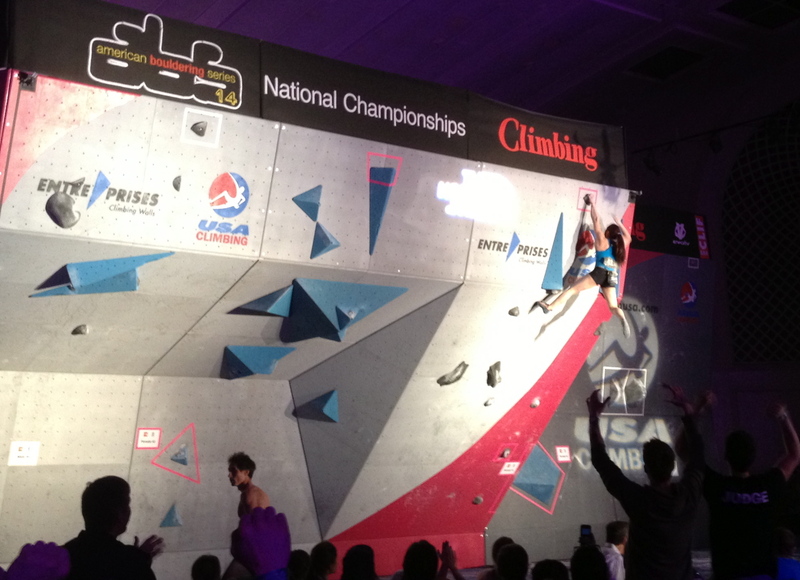 On the left is Daniel Woods executing a good toehook on the Men’s Final 4. Puccio did Final 4 3rd go for the full 13 points. 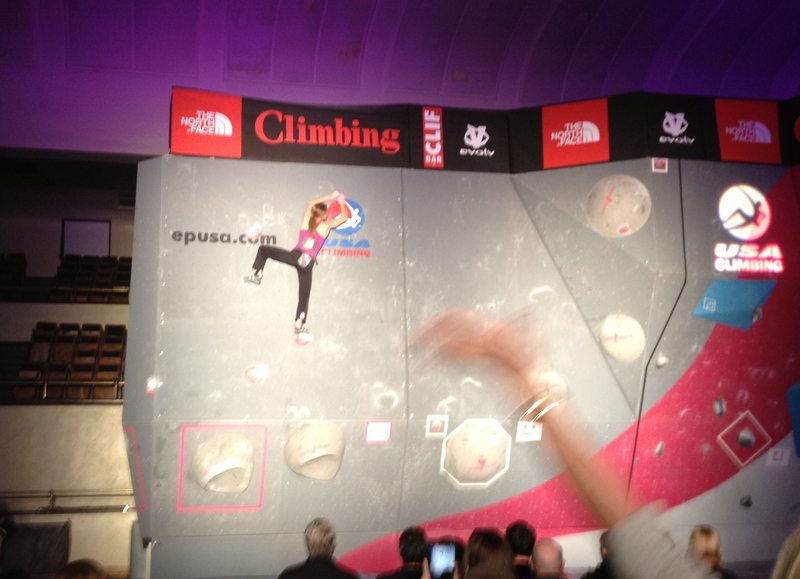 She’d already won, but she kept trying to give the crowd a send, and everyone was very very psyched when she to to the top. AJ got the next highest, with 9 points. Angie got 8. Lisa and Megan got 6. Andrea and Faus got 5. Megan about to jump off the double tufas. So that’s it. 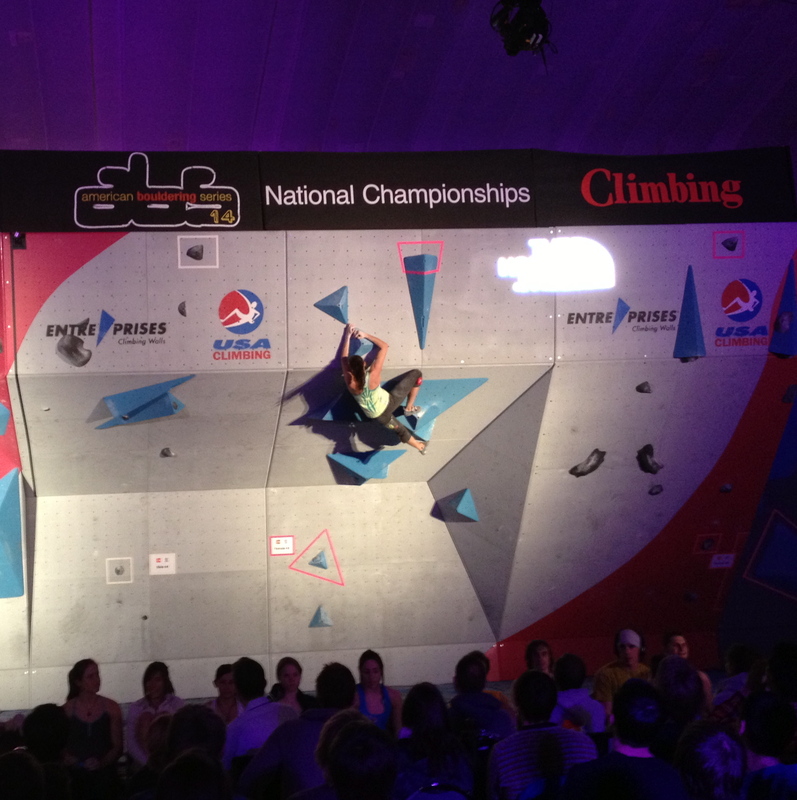 Watch the live feed replay if you get a chance, it was a pretty awesome comp. 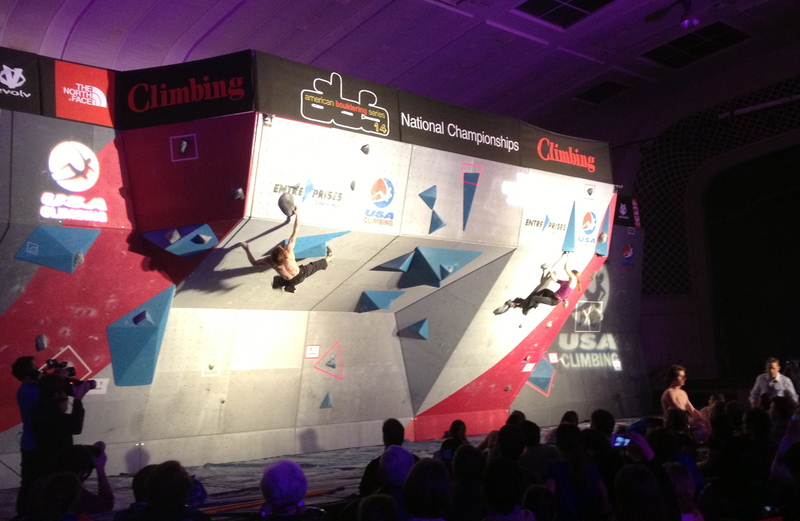 Nice job to all competitors, organizers, volunteers, live feeders, photographers…everyone!